In the metal world, Suicide Silence are so hot, the individual members' body temperatures must be over 106 degrees a piece. The Orange County, Calif. deathcorists are releasing the single, 'Disengage,' on April 20 in album and remix form. The remix comes courtesy of Big Chocolate, aka Cameron Argon of Disfiguring the Goddess and Burning the Masses. A sample of the remix can be heard on YouTube. The single will be available via two means: digital and a seven-inch, blue vinyl, with Joshua Belanger responsible for the artwork. Psyched? Then you can view and pre-order the vinyl now at the economical price of five bucks. Suicide Silence paired up with video director Thomas Mignone, who has lensed vids for Mudvayne, for the 'Disengage' vid. It'll debut online shortly. The band will also impact Warped Tour stages like a wrecking ball this summer. Beware, punk rockers. 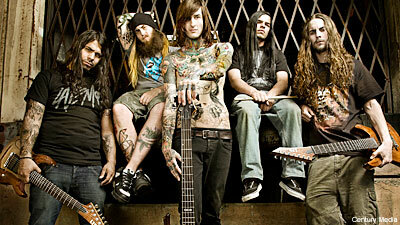 Suicide Silence will be the new sheriff in your town.